In my browser, the title is not visible. Transcriptions like these are often put in script sites. Cetainly handy for the dialogue when things get tricky, but without the headings and narrative descriptions (including sound) a lot is missing! Though it might be a useful exercise to put them in based on your own viewing. Film art has a greater influence on the minds of the general public than any other art. Learnt about the existence of this book from Film Studies for Free. The links there would keep even the most ardent film person busy for ages. English translation by Edith Bone. !952. Intro. begins straight away with wiki:kracauer‘s Theory of Film: The Redemption of Physical Reality (1960). Benjamin, Michael Fried on Courbet’s realism, Plato’s cave, rapidly follow by pages 5/6. This introduction is 16 pages, with all but the last page GoogleBooked. Malhereusement. Chapter 1 of Siegfried Kracauer: An Introduction by Gertrud Koch. The Salaried Masses By Siegfried Kracauer is GoogleBooked as well. It is of film interest because he also tackled the roots of nazism through a study of film in the Weimar Republic in From Caligari to Hitler: A Psychological History of the German Film. Revisited this film last week for about the 6th. time since buying the DVD three years ago. Some films you can rewatch regularly, some only after a reasonable interval. For me, TDLOV comes into the former category. Also there is the thing about different styles of viewing. This time, I let the whole thing flow over me: quite a few of the little details registered in a way that a fully-alert viewing might have missed. For criticism/analysis I’m relying on a compilation of what others think. These are not in any particular order of merit, though they might be annotated and re-jigged later. Later, too, comments on some feature or other – more than likely cinematographic rather than in terms of plot or narrative – might venture forth from the little grey cells and be recorded. For now, stum. March 2007 post from blog “The Ongoing Cinematic Education of Steven Carlson”. from Jamie S. Rich’s Criterion Confessions, which links to The Criterion Collection The Double Life of veronique page: handy because there is a short very clear video including part of veronik’s iconic “crystal ball” train shot. It turns out to be a clear plastic bouncy-ball, not glass. If you read meanings into everything in Kieslowski…..well read Comprehension of Film Narrative by Jacek Ostaszewki. Review by Independent Film Review critic Todd Conrad. A short review by Scott Tobias in A.V. Club, succinctly pointing to the core. Essay in The Criterion Collection. On the dialectics of filmic colors and red : Three Colors: Red, Red Desert, Cries and Whispers, and The Double Life of Veronique. Film Criticism, Spring 2008, Paul Coates. According to Eco (i.e. Umberto), overinterpretation is seeking in a film the elements of minimal meaning and assigning them with maximal consequences so that they match a prior premise (or premises). ….Overinterpretation is, therefore, not the excess of interpretation, but actually, “underinterpretation”. …..viewer’s relatively poor interest in the actual contents……..On the other hand, their attention is focused on the figure of Krzysztof Kieslwski as the representative of a quality art cinema. 60 min. plus radio discussion of Three Colours with guest Eduardo Lucatero. Straight text file of the same chapter. 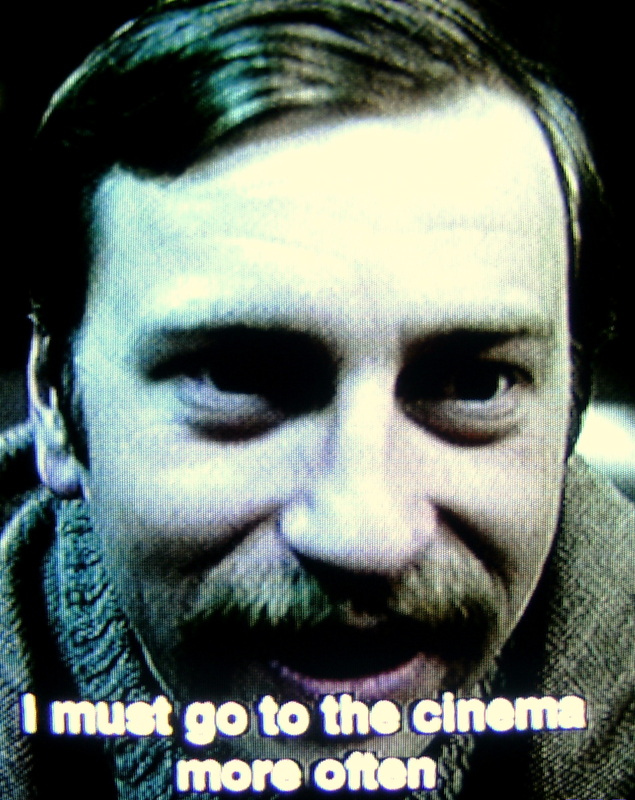 Zanussi plays a part in Kieslowski’s Camera Buff, as himself, but also in the form of an extract of his film, Camouflage (1977). 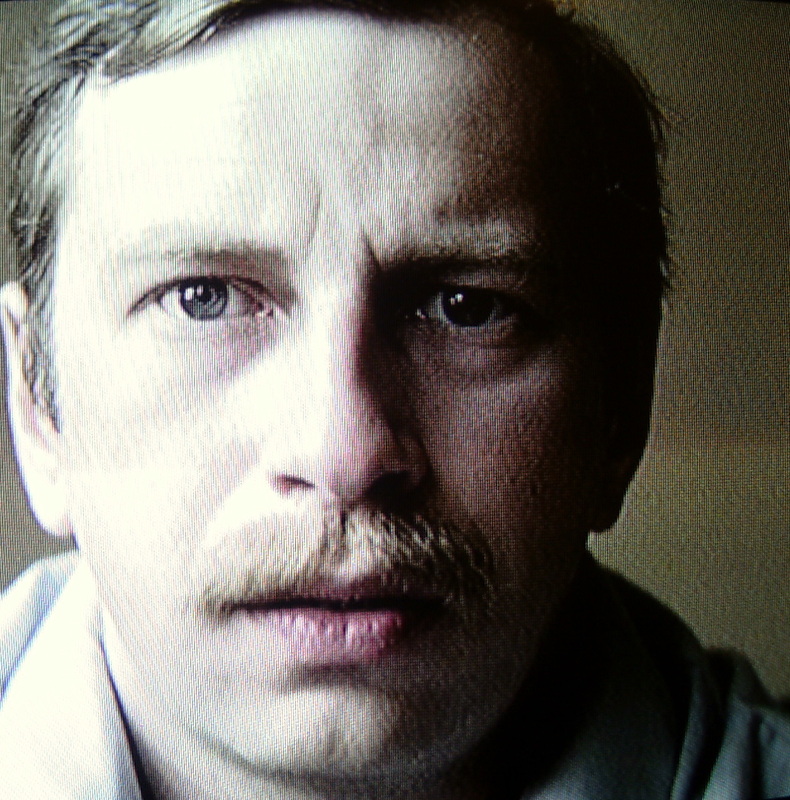 Filip Mosz goes to a showing of the film Zanussi attends. In Camera Buff, Filip has got to the stage of realising he needs to watch films to know how to make films. The still from the shot where Filip gets his film epiphany is in FODII post Concentrating on Kieslowski: Camera Buff. Dennis Grunes gives a succinct summary of Camouflage in his blog. There is a 2001 Leslie Nielson comedy also called Camouflage. A brief summary, Two Films by Krzysztof Zanussi, Zanussi’s Camouflage and a more recent film of his, Persona non Grata (2004) by Alan Pavelin in Talking Pictures. Some of these are probably linked to already in other posts. A duplicate link does no harm in a fascinating subject! several of the links at the bottom of this page are dead. A film student essay 1991. Author: not sure. Requiem for Kieslowski David Winner 1999 includes Zbigniew Preisner and Krzysztof Wierzbicki on Kieslowski. Some of KK’s own thoughts on film. These, though brief, explain a lot. The nub of kieslwski is here in a few simple, intelligible words. Jan Uhde, Prof. of Film Studies U. of waterloo, Ontario. For the moment it can stand alone. Offscreen is a new one to me: essays and reviews by the bucket full. My favourite at the moment is The Gap: Documentary Truth between Reality and Perception, by Randolf Jordan. For some reason, everything that resonates evokes a response, like a plumby, sarky voice-off, quoting Hitchcock’s, “Drama is life with the boring bits left out.” The question is in what way it might apply to documentary film. Linda Merelle: Kieslowski and Besson Meet in Le Cercle Rouge. Off Screen Journal has a broad range of essays and reviews of films and film theory. This post is meant for someone who has already seen Camera Buff and who is really into film. It is not especially a film review, nor is it exclusively analysis. I am not a film theorist: it’s all about going from the known to the unknown. This film seems as if it might be a pivot point for someone who is learning film because it’s somewhat a film about film. Often what interests me is less than the total narrative. What I’ve written is not fully formed and subject to change. Some of it may be repetitive, incoherent or just plain wrong. I’ll get there in the end. In the process of writing, I’ve been re-watched sections of the film using a DVD in a PC to get freeze-frame and also reading some of what is available online. Focusing on one brief film review (Canby) is a means of developing my thoughts, right or wrong, clear or confused. It may seem as if I’m picking on this now dead critic, when it’s just to have some jumping off points from which to work out my views. By the way, I’ve recently come across the word amateur again in another context: lover of, as in this free dictionary history of the word: “I am no amateur of these melons”. There is a growing list of possibly useful ref. material at the bottom of the post. Where possible I’ve linked to a reference in the text. In my mind, there isn’t as much of a distinction between documentary and fiction as there is between a good movie and a bad one. Cinema is not the reflection of reality, but the reality of the reflection. I don’t know what truth is. Truth is something unattainable. We can’t think we’re creating truth with a camera. But what we can do, is reveal something to viewers that allows them to discover their own truth. Photography is truth. And Cinema is truth 24 frames a second. The camera lies all the time. It lies 24 frames a second. ……a story of how the camera changes his life, just as the film changed Kieslowski’s filmmaking career, setting him on a path of dramatic filmmaking, instead of documentaries. GoogleBook. The best comprehensive summary. Some analysis. Pages 42-46. 47-52 missing. 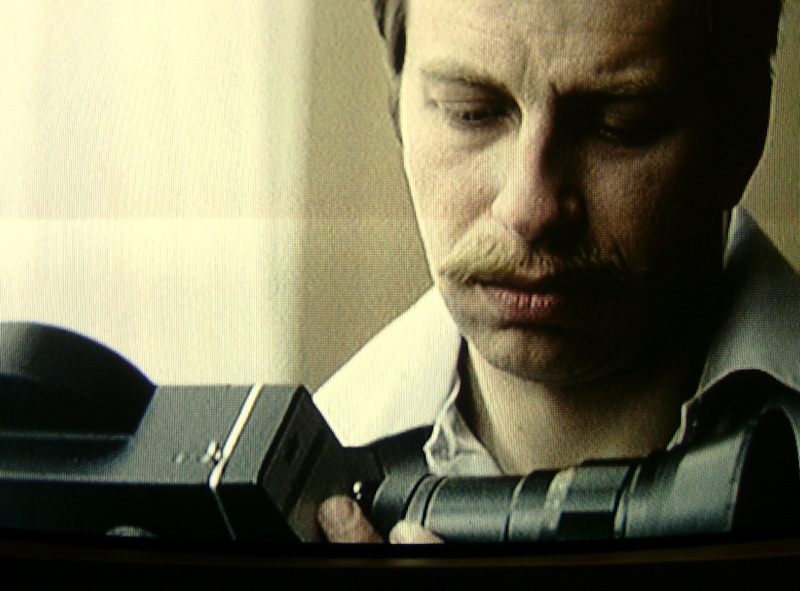 Filip (Jerzy Stuhr) buys his first camera during his wife’s pregnancy to record the development of his daughter-to-be. He is asked to record the twentieth anniversary of his state-run company, when the managers realise that he is the only one with a camera. As he makes the film his consciousness as a director is slowly awakened. The company head enters his film into an industrial film festival, facilitating Filip’s admission into the world of cinephilia. Anna (Ewa Pokas), an attractive member of the film commission, embodies this seduction. Through connections made at the festival, Filip is encouraged to make more documentaries, and even gets one aired on television. He finds that the camera exposes truths that do not gibe with the interests of the company, the state, or even the people being filmed. Filip’s total immersion into the world of film and his burgeoning ambitions as a filmmaker begin to destroy his marriage. We know that his obsession has completely taken over when he furtively peeps at his wife’s back, through a frame made by his fingers, after she has threatened to leave him. He has begun to filter and direct even the most real of events through the process of filmmaking. This TV Guide review has a short summary of the story. Filip faces the questions that Kieslowski has clearly asked himself. Is life filmed more important than life lived? Do movies have more than utilitarian value? Do his exposes of waste and corruption really serve the common good? Is he exploiting his subjects or celebrating them? Is he capturing reality or manipulating it? ….the original title of Krzysztof Kieslowski’s early film Camera Buff is Amator, which roughly translates as Amateur. The difference between the two titles is telling. Whereas Camera Buff implies that the title character is a hobbyist or an enthusiast, the word “amateur” implies something more than that. The common definition of “amateur” is “non-professional”, but the root of the word is the Latin “amator”, or “lover.” In other words, someone who does something out of love. There are two main struggles that run through the film, one psychological and one political. Psychologically, there is the struggle between a person’s need to create, to make something more important than himself, and his more basic needs, which are overrun by the destructive force of his creativity. In other words, as the camera is turned only on the outside world, the director destroys himself in order to amplify the world. It is in fact the act of ultimate courage to finally turn the camera on himself, after he has been neglecting himself for so long. The second struggle is the political one. Again Kieślowski portrays the bureaucracy in Poland in a sophisticated way. It is not portrayed one-sidedly, but rather as something with its own internal logic. While some of the censorship that takes place appears to be linked to corruption, much of it is justified by those who do it because there are real social problems created for the community when Filip ignores the censors. But this is also a nuanced point: given an atmosphere of (self)-censorship, a bit of unusual information can be truly harmful; but without the censorship to begin with, maybe full information would not have the same effect. It is worth reading the long essay by James Latham, “Your life is not a very good script”, David Holzman’s diary and documentary expression in late-1960s America and beyond, for Camera Buff study. Where Holzman succeeds the most is its ability to convey David’s infatuation with film and filmmaking. In his opening monologue, David tells us that “noted French wit Jean-Luc Godard called film ‘truth at 24 frames per second.’” David really believes in this, and it is an especially clever way to begin a 74 minute lie. There is a certain intoxicating naiveté to filmmakers with such an unabashed belief in the truth-telling properties of film. [My bold] And David’s glee as he walks through the city holding his camera over his head, to show off his new fish-eye lens attachment, is appealing. And perhaps the best scene in the film is a single extended shot of David’s friend Pepe tells David what the audience already knows; film is a complete disaster and was a terrible idea to begin with. The beauty of Kieslowski’s fictional take on documentary film-making is the pared-down style ( Noel Murray in his review calls it docu-realism) which allows everyone to see the joins. This simplification might seem to make the ideas simplified, which is not the case. Notions of what film is and can do are never easy.Camera Buff pitches its sale by positing a simple, honest – though not stupid – hero trying to make a home movie who gets caught up in the magic of film-making. All the films were good from the beginning to the end. It is a tragic paradox of Krzysztof’s life that he was long undervalued outside Poland. The Moscow Film Festival success of Camera Buff didn’t open doors to the world. Later, the Cannes festival, initially dismissed his films, saying he was a local artist, of no wider interest. He knew people’s opinion was fickle. One moment they dismiss, the next they praise. They dismissed Blind Chance, Camera Buff and No End. It’s incredible how stupid the reviews were, how senseless. Suddenly everything became great. People looked at the films again, or for the first time. He had been well esteemed in Poland but as “a good local artist”. Untrue. he was as universal at the beginning as at the end. His films weren’t local, requiring special knowledge. We’ve seen Iranian films and understood the evil of suppression perfectly. It’s an illusion of stupid critics and lazy audiences to consider a film local and incomprehensible. Krzysztof was lazily, thoughtlessly dismissed. It takes a little bit of effort and faith to understand. In art there is no such thing as perception without effort. The artist gives, and the receiver has to believe that it is worthwhile. Sometimes there are artists who are boring and tiring with nothing of interest to say. Krzysztof was saying most beautiful things in that former Polish reality. the reality has changed, but the human dramas remain unchanged. Much of the film means to be uproariously emotional, but the events we see seldom justify all the overwrought reactions. Mr. Kieslowski also appears to suggest that art – in this case movie making – must be a process by which the artist consumes the raw materials of his experience and then spits them out as finished art, leaving the people around him in the state of gnawed beef bones. This is a vast oversimplification of the creative process and is probably only applicable, really, to the second-rater. The director is on much firmer ground when he is satirizing the jargon of criticism and the clichés of film making. The film is funniest when it shows us Filip escaping from the various personal crises in his life by stepping outside himself and seeing it all as something to be caught in a viewfinder. 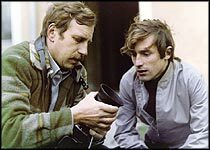 Krzysztof Zanussi, whose new Polish film, ”The Constant Factor,” is another New York festival entry, makes a brief, amusing appearance as himself, a successful director who offers sage advice to Filip and other young film makers. Canby’s take on the art of film-making depicted in Kieslowski’s film seems way off beam. Maybe he didn’t watch the film too carefully. Maybe he couldn’t deal with – allow for – the cultural differences. If part of what he means is that people are effected by the power of film to the extent that they tend, at times, to believe film over life – that the art of film of their lives makes their lived lives seemed diminished – he may have a point. But is he saying this? Kieslowski himself may have been ruminating in this film that human lived lives can seem paltry after versions of them watched on film. There is at the core the simpler question about whether documentary can tell the truth, but it is as much about artistic freedom and censorship. The phrase, “..the destructiveness of conscious artistic intervention ” is used by Dana B. Polan, in Brecht and the politics of self-reflexive cinema. Kieslowski may be satirising the poseurs in the amateur (and players the professional) film world through his depiction of various characters at the film festival, including Filip’s mentor, Anna, who might be a film/media groupie. But he is not being cynical when he shows how enthusiastic ordinary people are by seeing themselves in film. They genuinely take pleasure in Filip enjoying his growing success in film-making. All his has to be seen in the context of a repressed society. Filip’s films are eventually shown on TV: he becomes a local celebrity. But his subjects have been the very locals who now see him as a celebrity. They are liberated from the drabness of their lives by having the spotlight put on them through Filip, who in turn seems to be moving up and possibly out. Filip’s first film, Jubilee, documents the 25th. anniversary of the factory. It wins 3rd. prize (there is no 1st. prize – they think theyr’e all pretty bad!) at the amateur fillm competition in Lodz. His mentor Ana is on the committee. She later tells him his film is not good but she wants to encourage him. Filip’s second film celebrates the life of factory worker, Wawrzwec, a dwarf. The TV company have accepted it for transmission. Family and friends sit down to watch the finished super-8 film on TV. Wawrzwec is soon overcome: he can’t watch the film all the way through. Filip leaves the rest watching the film to comfort Wawrzwec. Kieslowski is claiming film can do this kind of thing is a special way. In any case, here is the juxtaposition of the witnessed life lived (these people all know Wawrzwec) and film depiction. He may have been moved by the way he was presented; he is certainly moved in some way the film does not precisely show; he is pleased, but also overwhelmed. Film (and here, we might forget, it is a novice’s documentary efforts…) has made him a star in the face of his very ordinariness. He has knuckled down for 25 years to a pretty thankless job, but not come out of it bitter. Has the film created a character called Wawrzwec who bears some resemblance to the real life person, but is not him? Or has it captured the truth of the man in the edits of the short film? We don’t know because we don’t really see the whole of the film. We can’t judge based on what we see of the man in the film we are watching or the film make of him. We can only wonder if this is what film does. This all makes better sense if we know Kieslowski’s early career was in documentary film-making. Thomas Hibbs’ piece, Kieslowski’s Inescapable Moral Horizons, might be worth reading at this point. We, the audience, see some of the completed Wawrzwec documentary when family and friends watch it on TV. Earlier, we see Filip shooting scenes for the film. In one sequence they follow him from the washroom to his lockers, the harsh camera light carried by Witek, Filip filming, and Wawrzwec, and other workers all crammed into a narrow room. In another shot, Filip executes an obviously planned pan. First, he films through a large window as the workers – the hero of the documentary, Wawrzwec in front – walk out of the factory, then he pans through about 45º to film through what soon becomes apparent is a smaller frosted glass window in the upper part of a door. A second or so into this frosted-door shot – we see just enough to see an unfocused head or two passing left to right – the filming is blocked by factory manager Halski putting his hand in front of the lens. Kieslowski has offered us an opportunity to see what is in the mind of the Filip the film-maker. 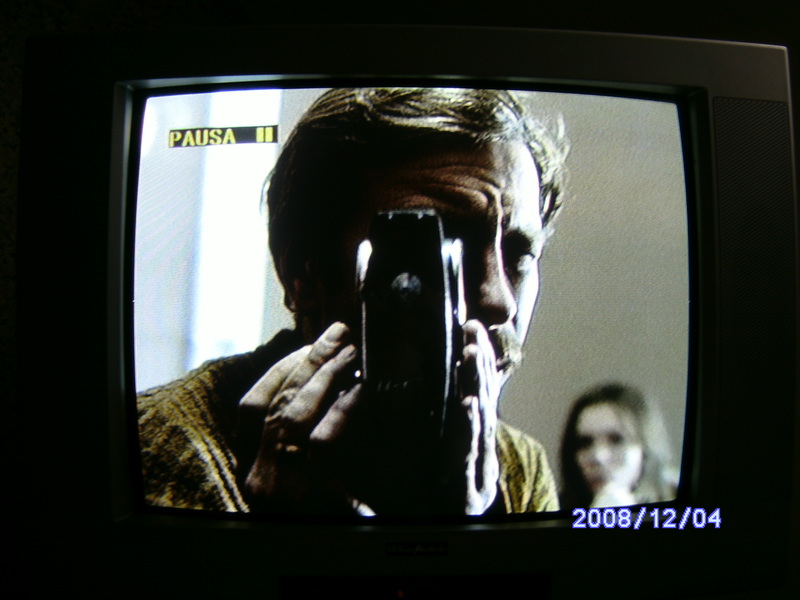 Kieslowski does not cut in a shot from Halski’s point of view, immediately after his hand goes to the lens: a shot that would have been filmed from the door side, with Halski in front to of Filip holding the camera. Instead we continue to be shown proceedings from behind the documentarist’s shoulder. We see what Filip would have filmed if he had been allowed to: a procession of unidentifiable heads moving across the door window. We have a clearer idea of Filip’s cinematographic and filmic intent confirmed once Wawrzwec opens the door to ask if the shot went o.k. We see that it is indeed a visual expression, as eloquently as it is possible to say it in words or images, about how Wawrzwec triumphs over adversity. Filip is clearly a film-maker with flair. And yet, we must remind ourselves, we are not watching a documentary but a scripted movie showing us all this going on! We are looking through one window into another. And yet by the style of filming, we tend to see it through the eyes of Filip. At the same time as we get a satisfying cinematic explanation in the movie, about how a documentary-maker can achieve such an exposition, we are getting the hint from Kieslowski — a renowned documentary film-maker in Poland before he was known in the West for his feature films — of his later expressed belief (e.g., Kieslowski on Kieslowski) that fiction can tell the truth more sincerely than documentary. He does this by choosing a scripted fiction film as the vehicle rather than a documentary film of a documentary-maker! What might have upset factory manager Halski is suggested visually. He suddenly appears in shot from the right, blocking the lens with his hand, loudly demanding what Filip is doing. The immediate short dialogue between Filip and Halski tells us Halski is unhappy with Filip using a dwarf to represent a model worker in his factory, but not if he has seen Filip’s cinematographic and aesthetic intent. He doesn’t ask him to explain what he was trying to achieve by filming in the way he was. The final action this scene has Filip thumbing his chin at the back of the departing Halski, showing us Filip intends to control the documentary. He is finding his feet. He dissimulates in his remarks to Halski in order to create the film he wants, planning to circumvent the censorship the apparatchik wants to impose. In other words, he seen as intelligent enough to know how to make films that get around the control and censorship, which is what Kieslowski himself had to do as a documentary film -maker: he stopped making documentaries when a film he made of a railaway station was conviscated by the authorities. He suspected they wanted to indentify people. Later we understand, if we did not before, or immediately the blurry heads moving across the ‘screen’ formed by the small window in the door: it is telegraphed by Wawrzwec opening the door to show his height compared to the frosted window – the level of the window in the door means that the hero of Filip’s film will not be seen in the ‘second’ part of the pan. The ensuing dialogue between Filip and Halski tells us specifically the manager was concerned filming the midget was making fun of him (and so, of course, the organisation). Why couldn’t he chose some else, he asks. This dialogue between Filip and manager, another mini-essay on film, about the filmmaker knowing what he is creating and the non-filmmaker being unable to understand. Or is it? It does show the manager knows perfectly well – with none of the filmmakers knowledge – film can be used for negative as well as positive: not so hard, since every one has seen enough films to know how it can work. He asks Filip why he chose that particular worker. Is he, he asks, trying to make fun of him? We are getting Kieslowski’s development of a character who seems at first to be a hardened, cynical man who knows how to play the system to protect himself and his workers. When Halski leaves, Witek asks Filip what Halski had wanted. He indicates he wanted to censor his work. Filip flicks his chin with his fist, in what presumably is the Polish equivalent of a ‘V’ sign. This process, in a few shots and a few lines of dialogue, is in itself an essay on how all-pervasive film and film thinking is, even at an intuitive or subconscious level. Most cinematographic tricks are familiar to viewers. Other ‘essays’ in the film make the point that the documentary filmmaking process (as, too, the fiction movie) has limits: the person, admiring the Mona Lisa’s smile in the Louvre may suddenly get a pang of seeming comprehension of how its painter might have come to see the smile he then painted, but they do not know how it was painted. (There is one way in which the viewer of the painting can understand how the smile works: it is said that women of the time learned to smile with one side of the mouth.) That is special and unique to Leonardo Da Vinci. Only part of any film is ‘accessible’ in this sense. Yes, all the director does to achieve this is to splice segments of his film together in a particular order – but what an order and what an effect! ….Kieślowski produces a self-reflexive film – a meditation on film-making, its pleasures and dangers, an essay about being faithful to oneself and personal sacrifice, as well as about the responsibilities of being an artist. The best complete summary of camera Buff is in this book. Quite early on in Camera Buff , Kieslowski is wanting to ask if film — by its very nature — always does certain things which are less that the truth. In particular, it is well known that Kieslowsi was, by inclination, predominantly an editor. That is, of all the processes involved in making a film, he got most fun out editing, feeling he was creating the film at this stage in a way he wasn’t when on location. He said he filmed shots with editing in mind: he made sure to get extra material that is often seen to be needed only after the editing process begins. It would be interesting to see how film-makers vary on that: whether this care with shooting enough material can be said to Kieslowskian or a relative commonplace of filmmaking. 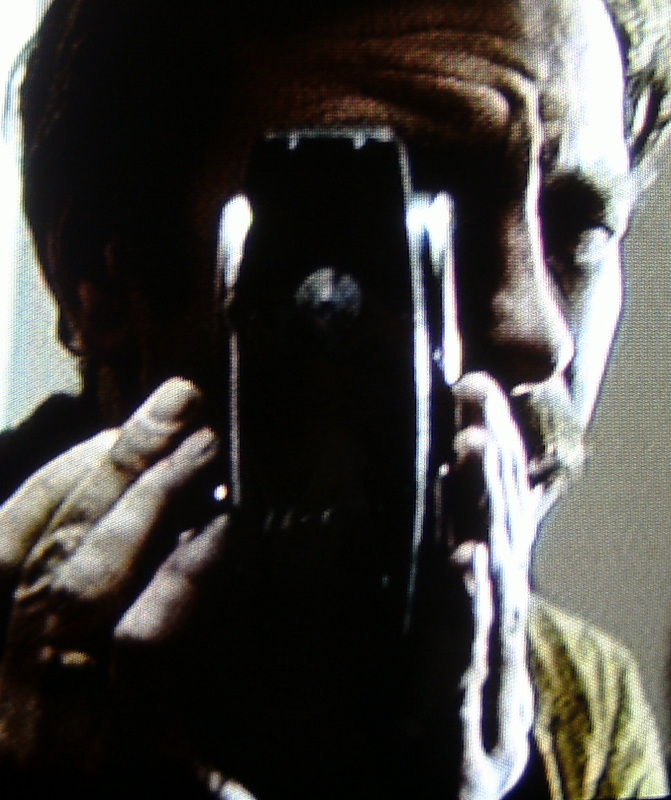 The question of the style by which he created his films – the balance between filming and editing – and what bearing this might have on examining in detail a film like Camera Buff, could also be examined. Few, on reflection – filmmaker or audience – come to believe that film does the job of depicting truth better that real life operations in the real world. Kieslowski’s own journey, from documentary to feature film, illustrated the truth of this. He came to believe fiction film could reflect truth better than documentary. However, this can be explained by both his learning about the capacities and limits of film as he made them, and that his documentaries were so often censored by the authorities. In one case a film of his was confiscated. Though many films that have done the job of highlighting some problem, or helped bring some injustice to a wide audience, films of themselves have never been the end of the story. Reviewers and critics of films often seem to treat film as a medium as a straw dog. The severe critic of films seems to have his cake and eat it, both saying film is never going to truly reflect things – it can’t by it nature and limitations; a few licks to many (or too few) of paint on the canvas can leave it over-painted or incomplete (which is, in any case, a perennial thought in the mind of the serious filmmaker) – while himself having viewed the whole of a particular story through the window a particular film-maker has made for him..
Canby’s remark about Camera Buff: “The film is funniest when it shows us Filip escaping from the various personal crises in his life by stepping outside himself and seeing it all as something to be caught in a viewfinder”, can be expanded. Perhaps it could be expressed this way: there are two counterpoised essays in Camera Buff , one, how art can accurately reflect life in ways that lived life can’t: it can see into things in a way that personally examined life fails to; two, how life is life and art is art: any feeling that art gets close to the truth being an illusion of technique and psychology. Some think art (film) can enhance what humans intuit and decide without being able exactly to explain what and in what way. Q. Is it enough for a director to believe he is telling the truth? Or should he try to verify it? Z. He must. And there lies out eternal dilemma. Wondering if what we’re saying is objectively true, or wise, without being able to specify how it can be tested. Each of us hopes that his film will help someone. That it will change society. But let’s face the facts. We are no longer alchemists of the soul, capable of changing the world. Criteria are relative. There are no hard and fast rules. We don’t know. And this uncertainty is our strength. It’s what drives us to say things over and over again. Differently, more tellingly, more precisely. When the audience meet Zanussi after the Q and A, someone ask him, “Did you study another subject?”. Physics he says. To me this says: quantum indeterminacy. The hero of Camera Buff is caught between the two arguments. He does begin to believe he can mediate life through his films, but is seen to be just as much part of life without film, all the way through the story. Though for him film seems to squeeze out life – the natural process of a learner film-maker – experienced filmmakers do not think or act like this. In the end, Filip decides he can’t trust filming others to tell the truth, so turns to filming himself and his own thoughts. Presumably he continues to find solace in film, still believing that is a powerful medium, armed with the only logical answer he can find to such problems — involve himself — as to whether it is voyeuristic and distorts the truth. This also gets around one problem highlighted in Camera Buff of editing a film into a shape which has unintended consequences. Aesthetics can play a part in this: how prettily a film is may actually distort the truth it was to meant to help faithfully mirror and amplify. 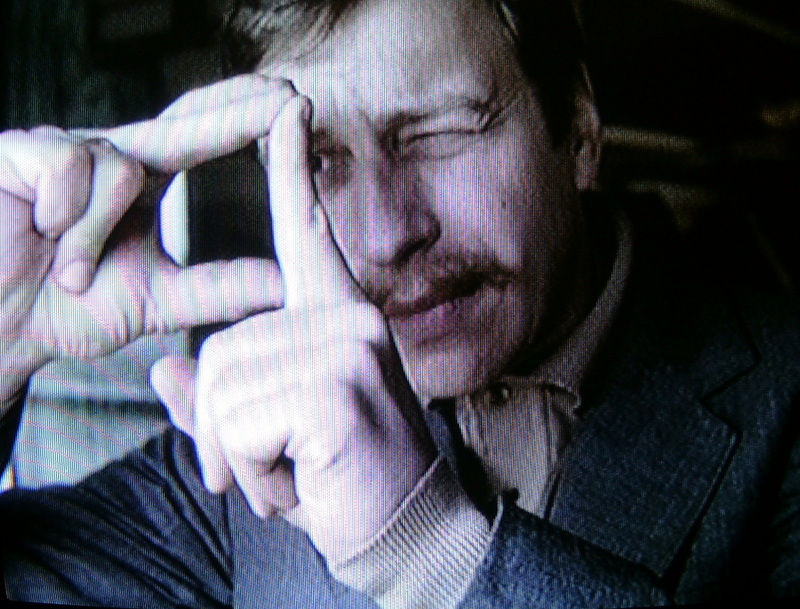 What Canby fails to do in his review – so providing a valuable service to someone trying to deeply examine Camera Buff as a means to answering fundamental questions about film – is to say Filip (through Kieslowski, the omnipotent filmmaker – a standard film-makers joke) has created the problem of this viewfinder’s eye of the world and is, in the film, coming to a resolution of the dilemma. Kieslowki is clearly making fun of, though gently, this process through which a novice filmmaker goes, hinting he himself has been there, done that. To begin with becoming fixated on film is for Canby to have put into the mind of the prospective viewer the notion that that is what Camera Buff is about in it’s entirety. This is to dismiss the rest of what is going on. Filip has persistent human concerns that run in parallel to his film-making. And he is clearly seen to be expressing his humanity with and without a camera. In the process of learning to make films, Filip realises there can be unintended consequences. His wife leaves him because he won’t stop making films: he doesn’t want her to go, exactly, but he wants to carry on filming more than he wants her to stay. Filip can’t resist viewfinding her back through his fingers as she goes through the door. She suddenly turns to look at him: he quickly drops his arms before she sees. Or did she see? It is obvious from his response, once she has gone, that he accepts he will never be able to make films with her around. At one point, he destroys his film on the brickworks before it has had an audience: he has been told the film will adversely effect the workers he thought he might be helping. In the novel The Unbearable Lightness of Being, Milan Kundera highlights a similar problem when Tomas publishes a letter in a magazine comparing the Czech Communists to Oedipus. If I remember rightly, someone at the magazine gets it in the neck as a result of the article. At least Filip, once told by his boss some of the reasons why the brick factory is idle, despite being proud of his film, can see ahead to the unwanted results it may provoke. Canby asserts the emotions in Camera Buff are overplayed. I can’t see this. Maybe Poles act differently to situations than Americans? Canby may suggest this sense of emotions being exaggerated because the acting is filmed in a quasi-documentary (or para-documentary ) style. If he had been able to understand the system under which these characters were living, he might have been less harsh on the depiction. Zanussi in his 2001 interview says that the film talks about little opportunity, when in reality there was none whatsoever. Living under an oppressive government and state machinery, Filip is overwhelmed because he has a chance to do more interesting and rewarding work, which he sees as having a social role. The others in the works film club are as excited as Filip by the prospects of being filmmakers. Everyone else encourages him even though won’t get the chance he has. There seems to be a perfect logic in making Mrs. Mosz over emotional. She’s got to be het-up enough to leave Mr. Mosz. In any case Kieslowski is not here or in his later fiction films making realist drama. Canby was obviously someone who didn’t want to be behind a viewfinder. He takes Mrs. Mosz’s part! The half jealousy, half-incomprehension, doing the job of pointing out that film is not just ‘a writing down’ of what people have done. The role of the manager in trying to control the end result of Filip’s film output is another essay on how film is not to be assumed to be a mere dry recording of events in a bureaucratic report; how the artist’s eye can conflict with the feared message; an extra ingredient the film-maker put into his film which lifts it above recording beyond the mere facts; what makes film an art which can produce great art. For Mrs. Mosz’s part, though she seems not to want to know anything about cameras and film, it’s more than that. It turns from mild interest in what her husband is doing in his new hobby, through to a desire that he does not succeed as a film-maker (some inclining of what this will mean for their future). Mrs. Mosz was initially happy for Filip to make a home-movie of their newly born daughter. However, when Filip asks her to re-enact scenes which he did not get as they happened, she gets irritated. At one point, as he films the baby in the baby chair, books supporting one of the legs fall away, causing the chair to tilt. She rushes to pick up baby, but he shouts at her, “Not yet”, then directs her to move into shot. She does as she is told, but afterwards sarcastically suggests he would have let baby fall to get a good shot. This a pivotal point in the movie, where Filip moves from recorder of events to film-maker. Another scene examining the truthfulness of documentray fiom-making is the one where he films a pigeon on a window sill as he waits in a corridor to film the toing and froings of committee members of the factory’s 25th. anniversary celebrations. These are both essays on the default position of documentary film, that it is never just what is there, but some other reality which is imposed by the process of filming. It is a universal cliché of home-movies that the participants are often seen to be acting up for the camera:reflexivity. Those who are interested in documentaries and study them cinematographically, know many contain elements of reconstruction in the same way that Filip’s baby shot is. Often a conversation is not the first conversation, but a re-filming of a conversation: the film-maker wants a better version. This debate about documentary film, in its turn, reflects another essay: that the non-filmmaker does not know what film is about and can produce, so cannot really criticise it in the way another filmmaker or film student can. Camera Buff starts with the Mosz’s happy with their simple, quiet life together, so Mrs. Mosz looks upon his change of heart – taking up the camera and neglecting her – as a betrayal. Later, as he catches the Łódź the train for the amateur film competition, she shouts “Don’t win!”. He doesn’t hear her amongst the noise of station. Some people protest about cameras about them: they are said to remove, degrade, or interfere with life, with the soul of a social event. Reminiscent of the thought experiment, Schrödinger’s Cat, it is also question that underlies cinema verité/ free cinema/direct cinema/ candid eye. Canby in his review of Film Buff can only be assuming looking through a viewfinder is not ‘seeing’ the wider world the camera is not recording. Filip’s starts off filming everything that moves, but this settles down into filming what he needs to make his movies. 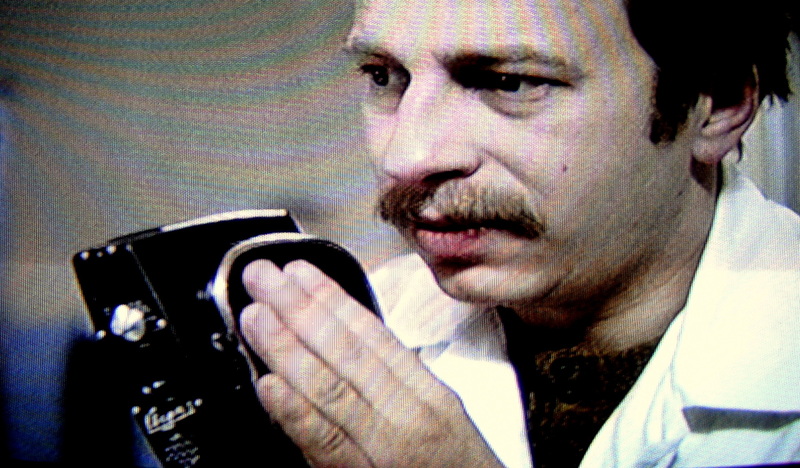 A scene depicts Filip’s first use of his super-8: at a party of friends celebrating the birth of his daughter, he removes the camera from its case and it is passed around the guests. There is telling shot in which a girl points the camera at Filip the wrong way round: Filip retrieves it and films the girl, then pans round the room, in an arc, till he sees through the camera (though it is not a through-the-lens camera) the TV screen, which is showing piano recital. He films the screen for a few seconds and then puts the camera down to remark that he is a fine musician. Kieslowki is mapping the territory: Filip is both being a cameraman and a human being. Though the running gag of the film is its cinematic reflexivity, it is still, Kieslowski is telling us, a drama about lived lives. Filip’s camera is always shown up and down. He looks at the scene as a whole in order to select what to focus on with the camera. A camera viewfinder does focus the eye on less of the total view: someone standing nearby might witness more while the camera man looks through his viewfinder. This is the metaphor of all cinematically self-reflexive films: that the lens can minutely examine something the eye might not see. As Filip shows, as he learns to use the camera, he can move it around to look at anything he wants, just as eyes do (Piotrek and his mother). Though we know the peripheral vision is reduced when a scene is viewed through an eyepiece. On other occasions he puts the camera down and looks directly with his eyes at the object of his kino-eye. In various shots he is seen carefully examining a scene without filming it afterwards (e.g. wife walks away from factory: he is about to film her but restrains himself). It seems rather pedantic but necessary to spell it out so that someone like Canby can’t get away with unthoughtful assertions just because he apparently does like (despite being a film reviewer…) life being mediated through a lens. What struck me as really funny about Canby’s remarks, highlighted in bold in the quote above, is it is as if he forgets to make sure his readers know that Kieslowski has made an assured film drama about a man with an amateur camera trying to making documentaries. It is as if Canby has himself has forgotten Filip is a scripted character. By comparison, David Holzman’s Diary is the classic mockumentary, which though a scripted fiction, is filmed as if it was itself a documentary. This is achieved by the the cameraman, Holzman, filming himself as much as others. No, Canby knows it’s a fiction, but his remark “This is a vast oversimplification of the creative process and is probably only applicable, really, to the second-rater” shows his form of words confuses Kieslowski’s vast understanding of documentary which shines through Camera Buff time and again with the character Filip as naive film-maker: the fiction film portrays the process his hero goes through to learn the true art of documentary. That is to say, this is film as a series of essays on the nature of film and film documentary. It is a film which is going to be viewed by people who are happy with nuance and the elliptical, but who are not necessarily totally au fait with the arcane art of documentary film-making. I was going to write: Canby is confused. This is clearly not true. But he has used a form of words which suggests the auteur doesn’t understand the complexities of documentary film-making because his fictional hero learns the art of film in simple stages. It is lightbulb clear, as we watch the film, Kieslowski understands perfectly. Camera Buff the movie is itself a kind of documentary expressing his knowledge of his art; how he explains Filip learning it; the gap between the two; the pitfalls. Kieslowski is playing with notions of what it must be like for a complete novice to start from scratch. Kieslowsi went to film school and so was taught the film arts. He in no way can be said to have done what Filip did, even if, in a sense, we are witnessing the stages through which Kieslowsi came to understand the problems of documentary making. That is because Kieslowski was taught how to do it, and Filip Mosz taught himself. One of the things Camera Buff shows is skill at making a film and the understanding of the limits and dangers of documentary film-making can be separated. On my watching, it was clear that Kieslowski presents, visually and in dialogue, a series of complex, subtle ideas about documentary film-making, at which he was a master before becoming a feature film-maker. The use of a semi-documentary style of cinematography in a feature film about documentary film-making is a subtler approach than documentary recording of documentary film. There is nothing simplistic, as Canby says in his short review, except the uncluttered style: certainly not in Filip’s struggle to learn film-making and his epiphanies about the film art. 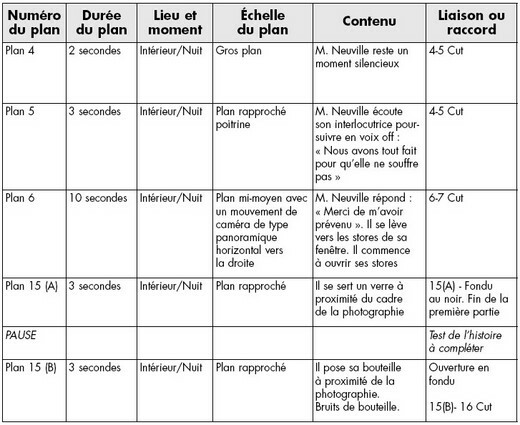 What is shown is a stage-by-stage process by which Filip moves towards being a good film-maker. The four photos above of a sequence of shots lasting about 30 seconds, shows how Filip already has a grasp of what documentary making involves. We are even shown in these shots his dogged persistence in having a go, when others are trying to stop him. First, the side window shot, then through the frosted glass of the door. Manager Halski intervenes to put his hand over the camera. Immediately Wawrzwec, the star of the documentary, opens the door to ask how the shot had gone. The essay is complete: if you did not get it from the brief shot through the frosted glass of the door, as a few blurred heads move across the smaller window like a monitor or TV screen, you get it when you see how tall Wawrzwec is in relation to the door. There is telling moment at the beginning of this sequence, with Wawrzwec walking towards the camera: using freeze frame on a PC moving the video on very slowly, he can be seen looking directly at the camera for a fraction of a second as if to say, “Am I doing it right?”. The whole of this sequence – including this almost sublimal act, the way Filip films it, and Wawrzwec opening the door to confirm the method Filip was emplying to visually describe what he could not in dialogue – though in narrative terms concerning censorship and artistic freedom, is also the essay, What is documentary film?, which started with Filip coaching the pigeon on the window sill. There is a essay in Off screen Journal by Randolph Jordan, The Gap: Documentary Truth between Reality and perception, which rather laboriously deals with some of this question. Camra Buff, as a whole, can be seen in these terms, as an intermediary stage between fiction and documentrary film. All very neat: Kieslowski himself moved from documentary film-maker to movie. Camera Buff was particularly moving to me because several years ago, I too started out, like Filip, filming everything that moved – with a HDDV camera rather than a hand cranked super 8 – and I too, later, came up against what effect a documentary I was trying edit into shape would and could have. At first, the sheer excitement of seeing how one could pre-empt shots – plan a set of shot positions; plan to shoot various alternatives; take more video than one knew would be needed in the final film; how effective soundtrack and voice-over were in different combinations: even think of music as one filmed – and then, in the shaping of the final film, the pleasure in having one’s hunches about what to film confirmed in editing, can override notions of truth in documentary. In the process of technically making a film you are missing the point about truth. Kieslowski shows without ambiguity that you can’t be a serious film-maker and not realise at some point there is a problem of whether your film reflects the truth. Two points about Kieslowski: one, he admitted to making the same film over and over, and that Camera Buff clearly runs through all these permutations. One of the clever ways he has done this it to have the script itself disguise some of these purely filmic problems. There is a story about people in there as well as one about film-making. It became evident as I tried to edit my video, I had managed to film some sort of narrative I had partially preordained but that (a) I hadn’t got enough video, and (b) there were many different ways of telling the same story. In Filip’s first attempt – which he recognises, even at the editing stage, hasn’t got enough footage – with the added complication several pieces of footage he really wants to included have to be left out by censorship – he is shown to have had some sort of innate imaginative flair: It is almost as if he himself is surprised by it, not being able to say why he for example chose to film the white pigeon. Which, in its turn, may be Kieslowski saying there are givens, defaults in a way, which anyone attempting to make a film documentary will soon see, or should if they have any cinematic, filmic, moral and aesthetic sense. Or, more slyly, that those who are going to end up good film-makers will. And, finally, that those who haven’t a clue and could do it, can none the less understand by imagination, what is involved. Or, indeed, that despite never going to be documentary film-makers, they should understand. Kieslowski unburdens Filip – a novice film-maker in the process of learning-by-doing, yet with natural flair – from some of these difficulties by having his works director telling him he can’t put certain scenes in. This is like Kieslowski saying, “This is what might happen at film school”: Poland under the communists. A script device to both show the censorship and to compress the process of Filip getting to the tipping point into proper film-making quicker. At the time of filming, Filip’s boss tells him not to put in shots of members of the committee going to and from the toilet. Before this, he has also prevented Filip from filming in the committee room itself, so Filip stands about in the corridor, frustrated, wondering what to film to make his story work. We are seeing, well telegraphed, that he does see a story ahead of time. He is not just filming first and thinking later. We are shown the imaginative process of a film-maker quite clearly. Though he seems a simple guy, he is shown to have artistic flair. There is another telling scene in the corridor of the meeting. As he puts bread crumbs on the window sill, Filip sees a figure down below walking way, who he realises is his wife. There is a shot of her walking away. Then a close-up of him looking at the super-8 and shrugging. He knows his wife would not be happy if he filmed her. Or, it is Kieslowki saying he is beginning to overcome the shoot-anything-because-I-have-a-camera-syndrome. Filip is learning to focus on the film he has projected in his mind. That that is what film-makers do even if they are documenting events as they occur. The white pigeon part of the story may seem like an attempt to show he can be distracted into filming things that are irrelevant to the film. But I see Filip instinctively seeing a visual metaphor and shooting it. It is no accident the bird is white as far as Kieslowski is concerned! Filip wants pigeon and toilet, though at this stage (and we never see the completed edit) it is not clear how he will include them and how. After taking the footage of two men walking along the corridor to the toilets and then returning to the room, the director comes out to tell Filip not to film men going to the toilet. This is the first hint it is not going to be Filip’s film. Yet, he has his white pigeon footage to bargain with. Let me put that in, I’ll leave out the toilet. That is what in the end is agreed. Kieslowki is talking about his on experience as a film-maker. Here, though it seems like plain censorship in an oppressive state, with the company man automatically pre-empting what he knows his superiors will not want, Kieslowski is also telescoping Filip’s learning process by having another character point out what Kieslowski might have done in a talk on documentary film making, or that film student might learn at film school in more general terms about documentary film-making. 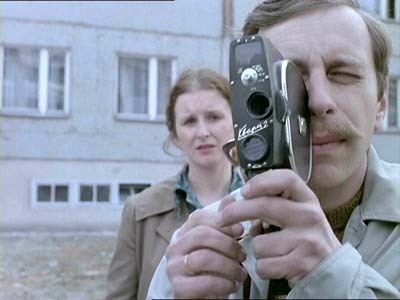 Camera Buff was released in 1979, in the thick of the communist era still. Solidarity began stirring the waters in 1980. It was a Polish film made by a Pole, which Poles at that time would completely understand. At the same time, for those with a clear view, not in such a system, the universal themes are there: highly transferable as Zanussi says. The viewer who comes to such a film understanding Kieslowski uses documentaries to get round the system, and tell the truth as he saw in it in a world where there was heavy censorship, would appreciate Camera Buff more. There is a sense that Kieslowski is always in his own films, feature or documentary. I like that. Here, as part of Filip learning his trade, or as some other character or part of the narrative. Or, in Red , where he is interpreted as being Judge Kern in some way while at the same time interposing himself as director, with a director’s powers to manipulate his own film, even if by so doing things included do not make any sense to the narrative. Some include the idea that since Kern is a Judge, he also represents God, the ultimate Judge. It is fine as an idea, but I don’t see it in the film. Like many movies about movie nuts who are as committed as Filip, Camera Buff manifests a strong sense of self-importance. It seems to share Filip’s conviction that there is something magical about the camera itself, sometimes confusing the importance of the object photographed with the camera that does the photographing. This is the opinion of someone who may have taken some family snaps but who never got as far as a genius like Kieslowski: a man, with his deep knowledge of cinematography, who would never confuse camera with object photographed. His films were long meditation on these sorts of things. Filip when filming his works conference, his first ‘commission’, Jubilee, realises this too. Afterwards, as he edits what he has filmed, despite having the insight – the desire, which hints at a natural film-maker – to film extraneous detail such as the white pigeon on the windowsill. Note Kieslowski here, has him not just filming the pigeon, but putting bread on the windowsill to make the pigeon come back, so he can film this. This is a question Kieslowki is asking about what documentary is and is not. It should lead the perceptive viewer to realising that the act of manipulating events can be separated from the camera recording them. There are quite well-known events which are known to have have been stage managed, and therefore are not ‘the truth’. One that springs to mind is the Romanian Revolution, which was both witnessed by the people living there and by the world’s media. It was later established that the shooting that went on was in fact a choreographed scenario in which disaffected sections of Ceaucescu’s regime posed as revolutionaries, in order to depose him. In some cases they couldn’t even be bothered to wear suitable disguise, so that men in blue uniforms were doing the shooting! This all became clear when details such as the supplies of food that the ‘revolutionaries’ had organised for themselves as part of their privileges as part of the regime. We are inured to simpler versions of ‘untruth’ every day in the modern TV age with the ubiquitous walking-to-camera, walking-past-camera, nodding, and door opening and closing shots: hackneyed shorthand which directors deem necessary or use without thinking. When you only watch your own national TV, as here the BBC, you are not necessarily aware of how distorting the presentations are. During the Bosnian crisis, a French TV report was shown on British TV. The style of camera world was a revelation. It exposed the nature of the BBC reporting as largely replying on second-hand reports and post-facto filming. A reporter talking to camera. The French report showed obvious real0time video of a camera team struggling up cobbled streets to enter into the courtyard of a house, and immediately interview a family. The difference between the two was so shocking different, I never took much interest in British TV reports from then on. Initially I solved my own problem of not having enough video to edit, by deciding to do my own talking heads, turning the camera on myself in the way I later saw Kieslowski makes Filip do in the final shot of the film. Kieslowski does this in order to show Filip has recognised the question that has crept into his mind after having done enough practical film-making to become aware of the problem of truth in film. He has made the character a complete naive to enhance the effect of the journey of discovery. In later debates with someone who was not into film-making, or even film watching, I was asked whether I was seeing my documentary too much from my point of view. Piotrek is not at his mother’s funeral. Filip attends with his camera assistant, Witek, without camera. 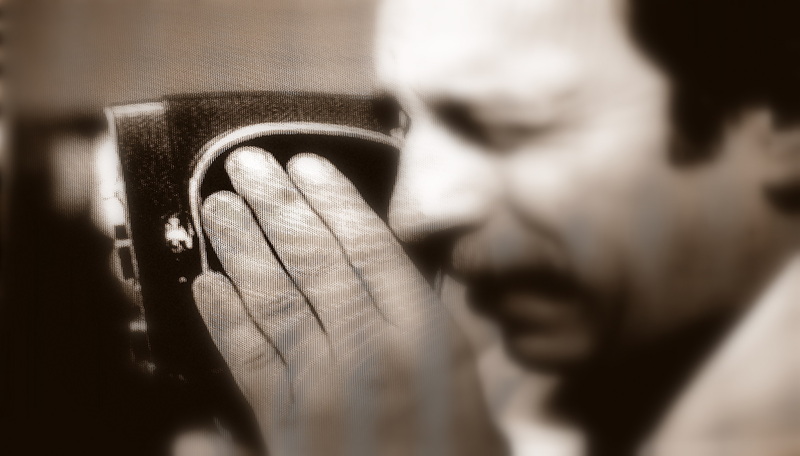 A later scene shows Filip’s wife crying: the implication she regrets telling Filip not to take his camera to the funeral. They find Piotrek barrackaded into his room with a wardrobe against the back of the door, which they have to push away. He is sitting still at a table. They console him. He tells them he couldn’t face seeing her buried. He then asks Filip if he can see the film. We see him being shown (and see it ourselves) the footage Filip has taken of the Piotrek/black van/driving/mother conversation. No funeral. But he can see his mother at the window, talking back down to him, and marvels : “What you’re doing is beautiful. Somebody is dead but still here.” He asks Filip if he can keep the film. kieslowski’s spiel on recording is a separate issue from documentaries as a whole being truthful or not. Though, at the same time, it is clear Piotrek’s film is a truthful record of events, whether or not edited documentaries are. In Camera Buff , our hero starts with a super-8 camera he bought himself, costing two months salary, but ends up with a more expensive Russian 16 m.m. Krasnagorsk-3, with a 200 m.m. zoom lens, bought by his company for him to use as part of the film unit/club set up with Filip in charge. The scenes of excitement of those in the ‘film club’ are surely to hint at the the film-maker’s sense of freedom. In a shot Filip takes after getting the 16 mm, he demonstrates the camera’s greater powers. Here the equipment is signalling his progress from complete novice with flair to gifted amateur. In a way, it might also be said to divide the film into two halves. Someone with views like Canby might see this as simplistic. Anyone who has attempted filming will know what it is like to try filming with equipment that is does match the shot already created in imagination! 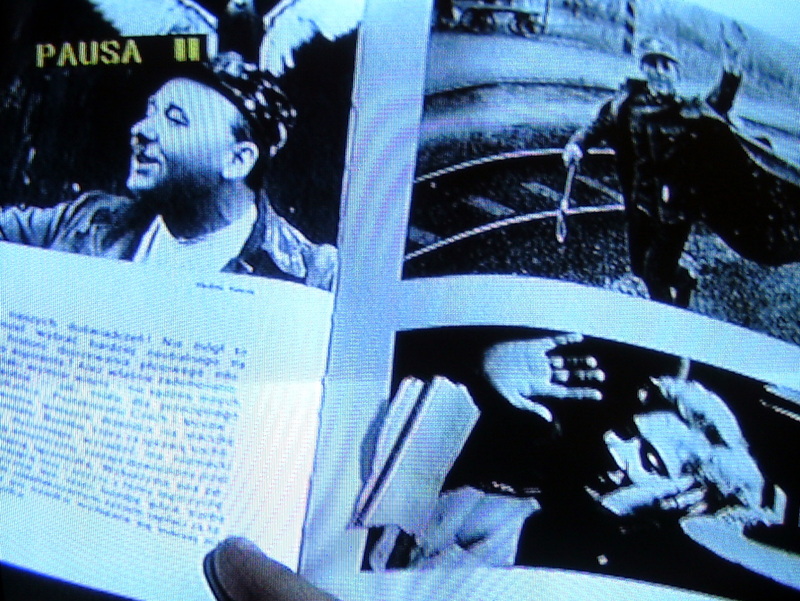 There are three scenes under the theme of “learning about film”: one, when Filip directly muses out loud, seemingly to himself, “I must go to the cinema more often”; two, where he is seen buying Filma magazine and the newspaper Politiyka at the train station after attending the showing of Zanussi’s film, Camouflage; three, when he is seen sitting at home leafing through a pictorial history of film: his wife asks him what he is reading. He says: “Just looking at pictures”. Film buffs know what the picture book might be: Classics of the Foreign Film, by Parker Tyler (1962). It isn’t: I have it. 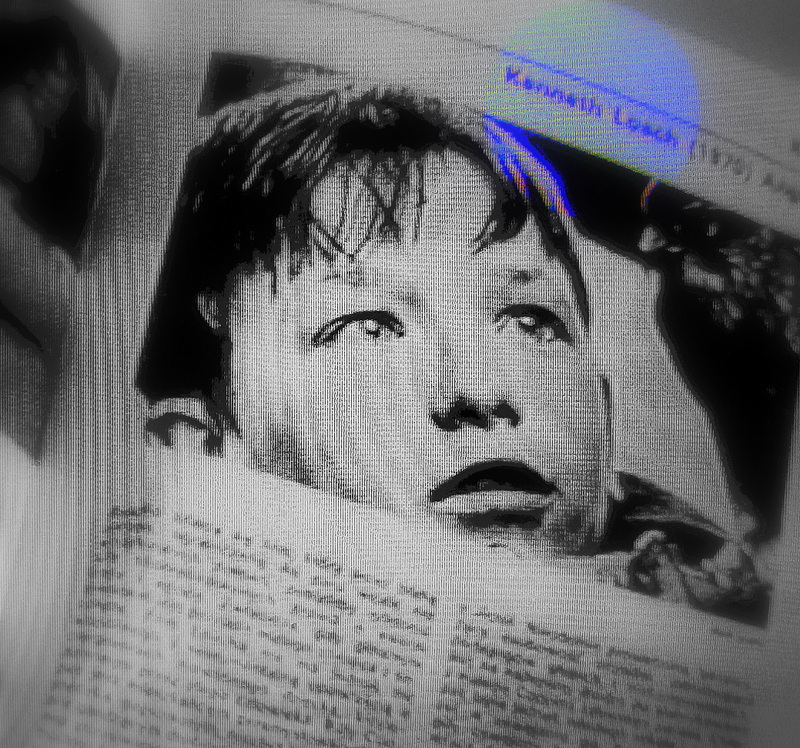 It’s Film History for Everyone (ref:Cinema of Kryzysztof Kieslowski by Haltof): Wajda’s Ashes and Diamond’s (1958), Jiri Menzel’s Closely Observed Trains (1966), Istvan Szvabo’s Father (1966), Ken Loach’s Kes (1969), and Karoly Makk’s Love ( Szerelam) ( 1970). Interestingly, Classics of the Foreign Film has two or three Russian and one Spanish, the rest Western Europe including Sweden, represented by Berman. Only two Polish mentions: Michael Wasznsky’s The Dybbuk (1938), and Wajda’s Ashes and Diamonds. The shot after Filip looking at a film book, is his wife waking: “I just dreamt a hawk killed a chicken.” The first shots in the film are of a hawk catching and killing a white chicken. This is one of Kieslowski’s favourite kino-tricks: retroactive cognition. This a film about a documentary film-maker, so we could wonder if the first shots of the film are Filip as film-maker imagining the hawk and the chicken. Or, perhaps near the end of the film, that this is the sort of shot Filip will or could achieve from the things he sees or hears in life. That is to say, his experience of the hawk shots are his wife’s telling of dream on waking. Notice, Kieslowski simply relies on her description – there is no repeat the shots after the dream. Kieslowski is a very intelligent film-maker and respects his audience to understand and to accept it is possible to use widely separated shots which still make perfect sense. Not unique but it must be noted and examined in his other films. Do other good directors do the same or as much? He uses this separation process time and again in his films. This is not to say that retroactive cognition shots were not around before Kieslowski. One of the ways he uses them effectively is by creating as uncluttered a film as possible, so they stand out. He has talked about realising that some will recognise the significance of earlier shots, while others may not notice. It does beg the question as to whether a serious watcher of his films might be better off watching them chronologically in order to see how his techniques develop. I started with Veronique and Three Colours, then The two Short films, Killing and Love followed by Camera Buff and a few snippets of Decalogue from YouTube. This was a choice dictated by things I had read about the films before watching them. Notice in the audience of the amateur film competition which Filip attends, bog-eyed in awe, another of Kieslowski’s friends, Krzyszktof Wierzbicki – he of large glasses and unforgettable nose – assistant director on Camera Buff, stands up to ask a question. He directed and interviewed in the documentary I’m So So filmed less than a year before Kieslowski died. Kieslowski’s scenario is never less than reasonable (Filip’s success begins with Third Prize at a Festival where the films are judged so poor that no Grand Prize is awarded), and the choices he forces on his unassertive hero are the kind that would frazzle more resourceful men. (For example: should he surrender the chance to represent his community with his craft, and possibly help to improve its living conditions, in order to salvage his once-blissful marriage to a woman who demands that he chose between her and his camera?) In addition to portraying a rainbow of wildly divergent social attitudes to film, Kieslowski also explores the corruptive urge to falsify the factual nature of the medium, at first on a personal level (Filip forgets to film his baby’s homecoming and pleads with his wife to re-stage the event) and then following it to the extreme of bureaucratic censorship (Filip’s imposing boss, who funds his documentaries, demands cuts that would curtail the self-expression of his work, and enforce its political correctness). Though made as a bittersweet critique of the restrictions imposed on East European filmmakers of the time, Camera Buff can be viewed as a more universal satire about art and conformity, the temptations of success, and the all-consuming allure of cinema. Long essay which doesn’t do film as such except in terms of anthropology, but does reflexivity a bit. Through the looking glass: reflexivity, reciprocality, and defenestration in Hitchcock’s Rear Window. 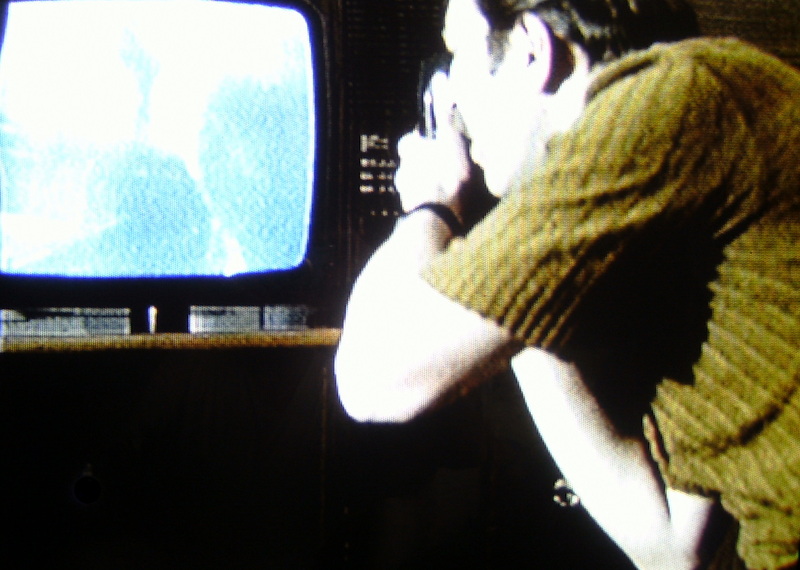 Hitchcock announces the reflexive allegory that connects Jeff’s rear window to the cinematic screen on which the film narrative is projected during the opening titles, when the three bamboo curtains on Jeff’s apartment window rise as a visual echo of the rising curtain in a theater. A GoogleBook abstract with a large wodge missing, but worth reading. Brief mention of Vertov. ….argues that David Holzman’s Diary is both an example of and a critical statement about filmmaking theories and practices that would become integral to contemporary documentary expression. More specifically, I examine the film’s discourses on cinematic reflexivity and individual identity, and how these relate to filmic and social practices that in some cases already had taken root and in all cases would become more prominent in the media landscape. Many links to all sorts. Eco’s theories start page 20. Runs over the same ground as above: may help to have a different explanation of the same thing!